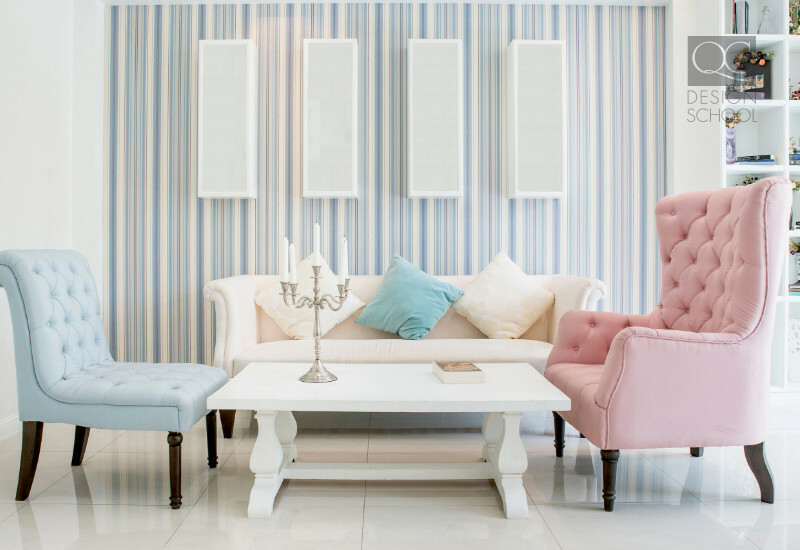 From choosing a pattern to adhering it to a client’s space, wallpaper can cause a major headache for home stagers! Even if you’re just decluttering and staging a space with vibrant wallpaper, you’ll need to know how to work with it! Without further delay, let’s get into it! 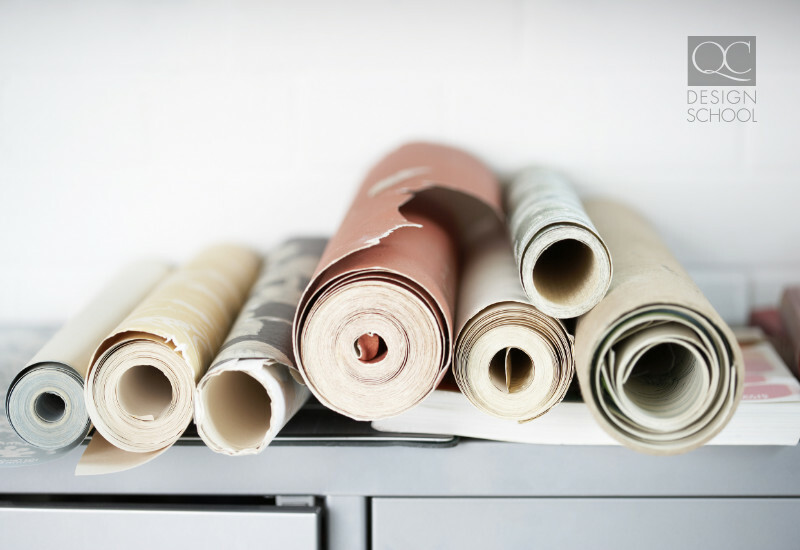 Here are some tips that will help you select, buy, and apply wallpaper! How often is the room used and what for? In any project, this is one of your first considerations before getting too deep into your plan! Determining how much traffic the room gets will help you choose the wall treatments best suited for the space. Unlike floors, people aren’t literally walking on wallpaper… but durability still needs to be considered! What events take place in this room? Certain types of wallpapers need to be in completely dry areas. This means avoiding bathrooms and kitchens. Are there children in the house? Do they hang out in the room? If so, you’ll want a durable wall treatment that can handle being banged up a bit. You could even consider choosing a pattern that will hide the inevitable imperfections. Is there a lot of natural or artificial light? Determining the lighting situation in the room is important when choosing the right wallpaper. The general rule of thumb: smooth finishes will (usually) brighten a space, and textured finishes will darken the wall or room. For example, in dark hallways or rooms with limited natural light, consider choosing wall treatments in light colors and/or with smooth finishes – these will brighten the room! What mood does the client want for this room? Once you know what the room will be used for, this question will be easier to answer. Is this a formal dining room that will be used only for fancy dinners twice a year? Or is it a family common space that’s going to be used for weekly family movie nights and Saturday morning cartoon marathons? Knowing the mood and tone of the room is critical in decorating a great space. As you may already know, colors and textures play a huge role in the mood of a room. So if you’re unfamiliar with color psychology, consider taking a color-consulting course or hiring a professional color consultant – it will change your life! Are there any permanent items or fixtures in the room? Finally, after establishing the characteristics of the space and its function, have a look around! Are there any pieces, such as furniture, window finishes, or other fixtures, that will stay in the room? Maybe the client inherited a mustard-yellow midcentury chair. Or you’re working on a bathroom with gold fixtures. These elements will help you finalize your choice of wall treatment or wallpaper to avoid overwhelming the space. Traditional wallpaper is the most common type of wallpaper. It’s primarily made of cellulose, which is environmentally-friendly and allows walls to breathe. This quality makes it great for bedrooms, children’s bedrooms, and dining rooms. You don’t want these rooms getting stuffy! On the downside, traditional wallpaper can be tricky to apply and may fade in the sun (so avoid rooms with lots of concentrated natural light)! Vinyl wallpaper is incredibly popular right now! Generally, these wallpapers consist of three layers: a backing layer, a paper or fiber layer, and a plastic coating. Vinyl wallpaper is extremely durable, making it perfect for high-traffic rooms or those with excess moisture (bathrooms, kitchens, and so on). But due to the chemical components that make up the wallpaper, vinyl wallpaper shouldn’t be used in poorly-ventilated places such as bedrooms or basements. Embossed wallpaper adds contrast to a room without a ton of furniture or décor. Remember, textured walls tend to darken a space. So textured wallpaper is best suited for large, open spaces with lots of light. Embossed wallpaper is also great for hiding imperfections on plaster – this could be handy when working in an older building! A downfall, though, is that they’re hard to glue down correctly and hard to remove without damaging the wall. Liquid wallpaper is made of cellulose and cotton fiber. It’s applies as a liquid (duh!) and is great for rooms with uneven walls or walls in need of some TLC. Just like traditional paper, it allows the wall to breathe and is great for bedrooms, living rooms, and other rooms with little moisture. Non-woven wallpapers are an up-and-coming trend! Though they’ve been around for a while, they’re gaining popularity lately! This type of wallpaper is very breathable and is durable against moisture and tears. This treatment is great for kitchens and bathrooms. Non-woven wallpapers are the most user-friendly since they’re tear-resistant, making application simple. However, they are expensive and non-washable. Fiberglass wallpaper is made of bonded glass fibers. This makes it durable and a great reinforcement to any walls or ceilings. Fiberglass wallpaper is also fire-resistant, making it a great option for kitchens! Though expensive and having limited flexibility, it’s one of the most durable types of wallpaper. In some cases, you won’t be changing the wallpaper at all! When working with pre-existing wallpaper treatments, consider the pattern and color of the wallpaper. 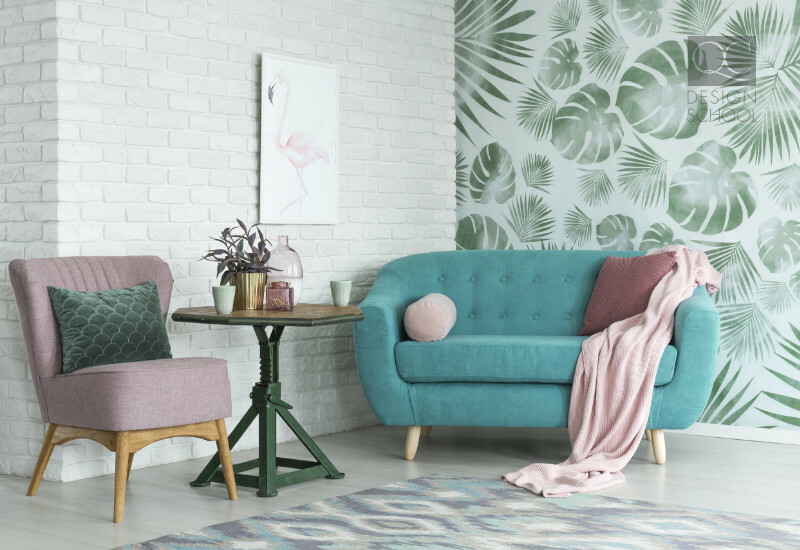 If your client has a bold-patterned wall, you should focus on simple furniture and décor pieces that will complement and tone-down the pattern. Perhaps the client has a textured wall that darkens the space. Bring in elements to brighten the room and create a more inviting space. The hardware store is a great place to start your search for the perfect wallpaper because of its wide selection and affordability. However, if you’re looking for a specific pattern, you may have to look elsewhere to find your dream wall treatment. If your client has a bit more wiggle room in her budget, it could be a great idea to look at designer and high-end stores for wallpaper. 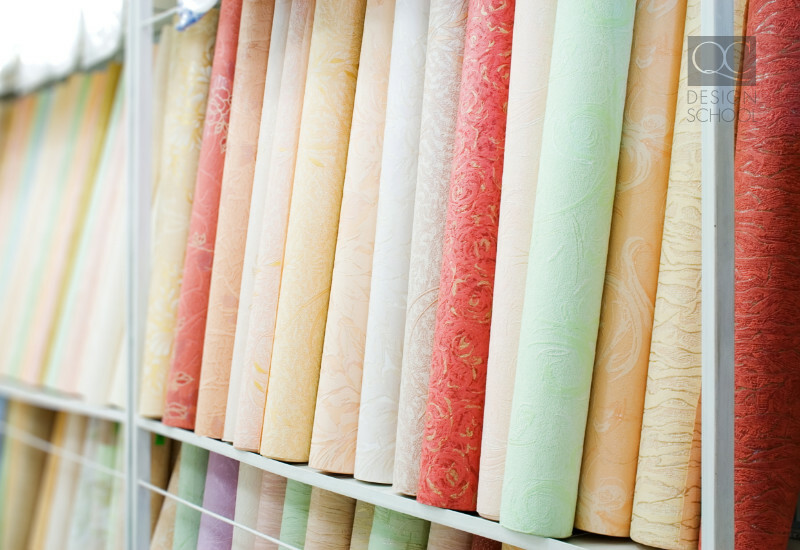 These stores will offer specialty and even one-of-a-kind patterns! For a stylish client who wants their room to make a statement, designer wallpaper stores are the perfect match! The Internet is a big place! If you’ve searched all the hardware and designer stores in your area and found nothing, check out online retailers. You can search for exactly what you’re envisioning for the space! The downfall is that shipping your materials can be pricey! Every home stager or interior designer will ask this big question. The answer depends on the type of wallpaper you chose! Consider how difficult the wallpaper is to work with and go from there! So if you’re doubting your abilities to hang the wallpaper without it looking like a mess, hire a professional! Do you have any tips to help avoid wallpaper headaches? Let us know in a comment! Interested in environmentally-friendly design? Check out this article on incorporating green design with professional organizing training!